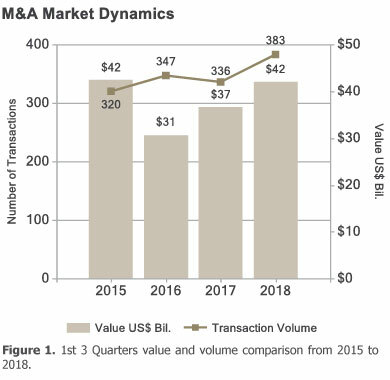 Q3 2018 Finance M&A Trends Report - Berkery, Noyes & Co., LLC. The highest value Payments deal in Q3 2018 was GrubHub’s announced acquisition of LevelUp, an analytics, loyalty, and rewards-based mobile platform that connects restaurants and guests, for $390 million. Total transaction volume in the 1st 3 Quarters of 2018 improved by 14 percent over the 1st 3 Quarters of 2017, from 336 to 383. Total transaction value in the 1st 3 Quarters of 2018 rose by 15 percent over the 1st 3 Quarters of 2017, from $36.6 billion to $42 billion. The segment with the largest rise in volume in the 1st 3 Quarters of 2018 over the 1st 3 Quarters of 2017 was Payments with a 33 percent gain, from 30 to 40 transactions. 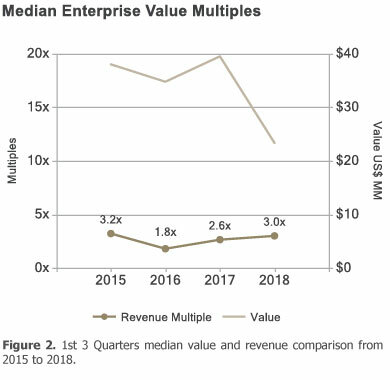 The median revenue multiple on a year-over-year basis increased from 2.6x to 3.0x. 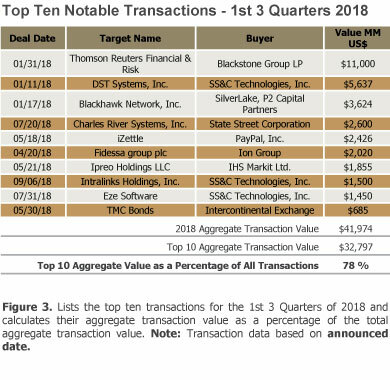 The top ten deals by value have seen three new additions since our half year report, including two by SS&C Technologies in the Capital Markets segment: Intralinks Holdings for $1.5 billion and Eze Software for $1.5 billion. These three transactions, with an aggregate value of $5.6 billion, represented 13 percent of transaction value in the 1st 3 Quarters of 2018 and 60 percent of Q3 2018 transaction value.